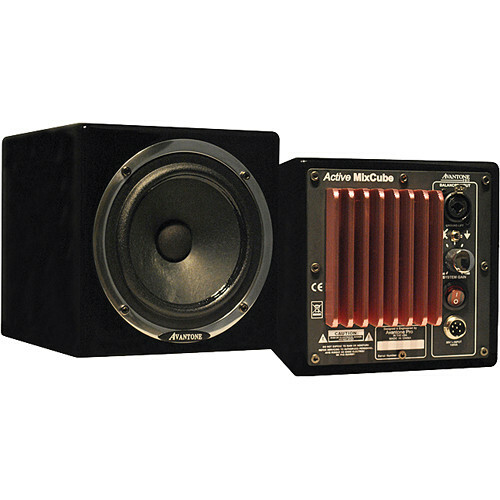 The Active MixCube features a powerful and accurate 60W (RMS) amplifier and 5.25" driver enclosed in a handsome MDF cabinet with a black finish. The input connector is an XLR-combo connection with XLR and 1/4" TRS phone inputs that accept balanced and unbalanced signals. There is a variable gain control dial and on/off switch. The speaker features an external power supply with a 10 foot (3 meter) AC cable attached to the power supply, and an additional 10 foot (3 meter) cloth multi-pin cable that connects the power supply to the speaker. The Active MixCube's small size makes it easy to place in any studio setting, and as an added feature, Avantone installed a 5/8"-27 thread microphone stand fitting to the base of the speaker. Box Dimensions (LxWxH) 12.9 x 10.1 x 8.2"